Stinging nettles are among the first plants to grow in early spring; they usually grow nearby rivers or on the outskirts of forests. They are easy to cook and they beat both spinach and broccoli for vitamins and minerals. Once picked up, undo the nettles, leaf by leaf. Then wash thoroughly, until no trace of earth or sand can be found in them. Put the leaves in a pot with boiling water, and bring to a boil a second time. Then take out the nettle leaves and allow them to drain completely, in a strainer. The elders used to advise that the juice the nettles boiled in be drunk in the morning, on an empty stomach, to help in a variety of ailments, or simply for their nutritional value. 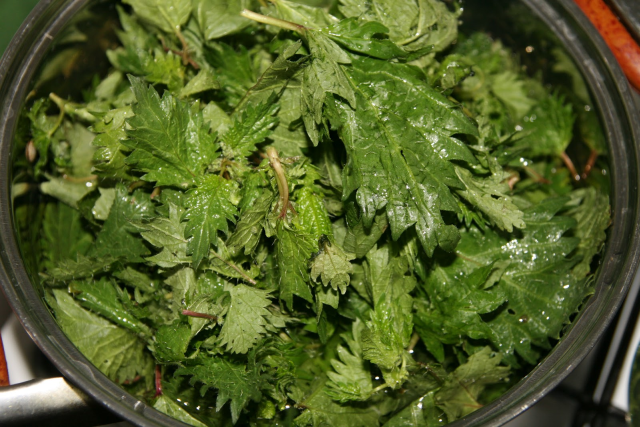 Stinging nettles can also be the used in many fasting dishes. They also go with sour cream, butter and even eggs. Boil in water, with a little bit of salt and a finely-chopped onion, then mash the nettles and mix in a little sunflower oil, sour cream or butter. You can also add mashed garlic. Alternatively, you can add the water in which the nettles were boiled, to turn this cream into a soup. Another thick soup can be made using fermented wheat bran brew as a souring agent for the nettle cream, in which you can also add some rice. After about a quarter of an hour, when you remove the pot from the cooker, sprinkle finely-chopped lovage leaves for flavour. You can also use the nettle cream as a filling for fasting-diet crepes, served as a starter. Another nettle-based combination includes fresh onion, leek, dill or boiled rice and can be used as a filling for a pie and served as a starter. The nettle cream best goes with fried eggs and polenta as a main course. Also as a main course, you can serve a combination of nettle cream and rice, known as pilaf. To prepare the pilaf, you need one kilo of nettle, three cups of rice and an onion. Boil the nettle and the rice separately, and then mix them. Add the finely-chopped onion, salt, pepper and a bit of oil. Boil a little longer, in order to get the nettle-and-rice pilaf. You can also add mushrooms, as they go quite well with nettles. Enjoy!